Our puppy parties are a fun way to improve your puppy’s behaviour and introduce them to new friends and experiences. During your puppy’s first 16 weeks, it is essential that they are exposed to a wide range of positive, new experiences. A well socialised puppy is more likely to grow up to be a friendly and outgoing dog. Dogs that have not been socialised can suffer from anxiety, fear and can develop behavioural problems. To sign up to our puppy parties, your puppy must have received their 2nd vaccination. Parties are run as 4 consecutive sessions, these are held on Thursday evenings at 7pm. 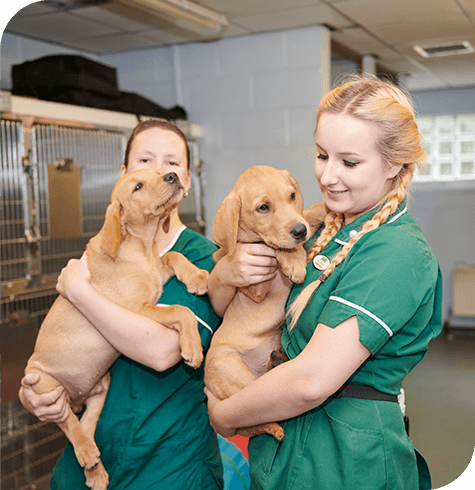 During the parties you will be given information on all aspects of puppy care. It will also get your puppy used to coming to the vets as well as getting weighed and examined. If you would like to enjoy the benefits of puppy parties, please contact the small animal reception team on 01535 602988.